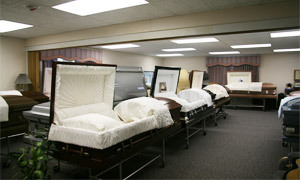 At the Dagon Funeral Home we have the area’s only fully stocked merchandise showroom. When you need to choose Caskets, Urns or Vaults don’t try to make a choice based on a picture in a book or a small model. We have actual full size display models right on location for you to see. So many of the decisions you have to make are difficult, let us make some of them easier.